You must select a range and unit colour to order this product. 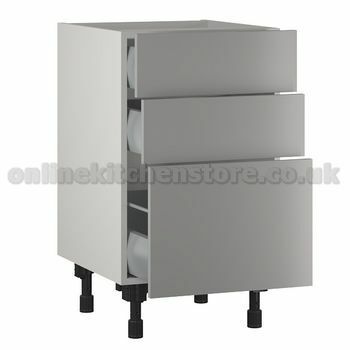 Please visit the main kitchen units page to start your order. There are no colours available for the current configuration of this product, please select different options to view available colours. Pan drawers are optionally upgradable to our stylish Crystal glass sides for an additional cost. This upgrade replaces the pan rails with frosted glass panels which doubles the height of the enclosed space of the drawer, making it ideal for a wider range of storage applications such as pots and pans, plates, labelled produce or other bulky household items such as food processors etc.